Dr. Chen Zeng received his B.S. in Physics from University of Science and Technology of China and Ph.D. in Physics from Cornell University. He joined the George Washington University in 2000. He conducts basic research in biophysics on topics ranging from big-data-driven biomolecular modeling and early prediction on the onset of complex disease. 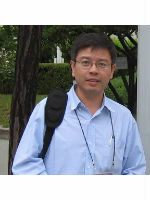 He serves as Associate Editor for "BMC Systems Biology" and is also on the editorial board of “Biophysics Reports”. His current research projects include trace metabolite detection in single-cell metabolomics and biomarker identification in autoimmune and cancer genomics.